GetUp! - Bust the Budget! The Abbott Government promised a fair budget where everyone would "share the burden". But the 2014 Budget has been widely condemned as unfair — disproportionately burdening lower-income families, students, young job-seekers, pensioners, and the sick. It represents a dangerous step down the path to US-style social inequality. And now Prime Minister Abbott is actually promising other G20 nations, including the U.S., to cut Austrlians' health and education after lying to us about 'no cuts' at the election. The GetUp movement is driven by a belief in economic fairness and a fair go for all Australians. Everyone should be able to thrive in the economy — not just corporations and the wealthy.Already, more than 150,000 GetUp members have banded together in the fight to save Medicare, our social safety net, and affordable higher education. 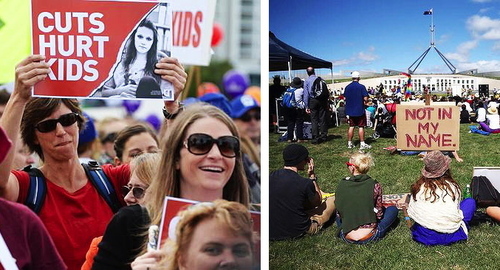 Will you stand up for a fair go for all Australians by joining the campaigns below? In a budget that will give a free pass to coal pollution and big mining, the Abbott government is trying to balance their books by charging Australians for getting sick. 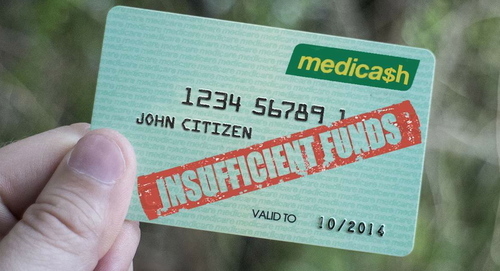 Mr Abbott's co-payment on Medicare will hit us with a fee whenever we visit our GP, leading us down the path of US-style user-pays healthcare that preys on the sick. With the Government facing a public backlash over their brutal budget, and pivotal crossbench senators deciding where they stand, we need to build the huge groundswell of opposition before it's too late. Let our politicians know that Australians will not stand for this shameful attack on Medicare. The Abbott Government has mapped out a new plan for universities, and it's not pretty. Here's the deal: with no limit on how much a university will charge, fees could double – with students paying up to $100,000 for a degree. On top of this, students could be stuck with more than 30 years of debt – and if you're a woman, a part-time worker, a low-income earner, or a disadvantaged student, you're likely to pay even more. This adds up to a dangerous equation: if these laws pass, future generations won't have the same access to education so many generations of Australians have benefited from – and those who do may be faced with runaway debts. Education shouldn't be just for the 1%. Urge our senators to block the laws and ensure education remains affordable and accessible for all.